One of the most well known microcontroller families is the Intel MCS-51. It was introduced in 1980 and is still being made in many many forms. It, however, is not the only popular 8-bit microcontroller. 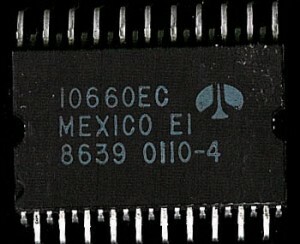 Motorola made many microcontroller versions of the famous 6800 CPU. Namely the MC6804 and the still in production 68HC05 series. ST, which was formed by the merger of SGS of Italy, and Thomson of France, also makes a wide range of 8-bit microcontrollers which are very popular and widely used. The ST7 microcontroller is a 8-bit Von Neumann architecture (shared address/data bus) MCU. It is a serial accumulator design (so all operations occur in the accumulator, rather than in a wide set of registers like the 8051). The ST7 was introduced in the early 1990’s as an upgrade to the ST6 Family of microcontrollers. The ST7 added more high level programming support, and better interrupt handling. The ST7 provides higher performance then many competing architectures and in various performance tests such as IRQ handling, returns, instruction execution times etc, it even beats the venerable 80C51. Both the ST6 and ST7 families are based on the Motorola MS680x microcontroller family. The ST6 closely resembles the 6804 and the ST7 is upwards code compatible with the MC68HC05 (assembly level translators exist to port the raw code). The ST7 has 63 instructions and the 6805 has 62 (depending on version). It is not an uncommon practice for one MCU to be based off, or even compatible with another. It provides more familiarity for programmers and design engineers. What really sets a MCU apart is the peripherals that surround the core, and its operating parameters. The ST6 and ST7 are both highly respected for their ESD protection and high noise immunity. These features were both carried over into the ST8M family that was introduced in 2008 to replace the aging ST7. The ST7 can be found in many applications such as automotive appliance control, motor control, and other embedded systems that most people forget are run by a processor. Bipolar Integrated Technology Inc. (BIT) was founded in 1983 in Beaverton Oregon by former Floating Point Systems, Intel, and Tektronix engineers. Their goal was to develop fast floating point processors based on a bipolar process (rather then the more common NMOS and CMOS of the time. 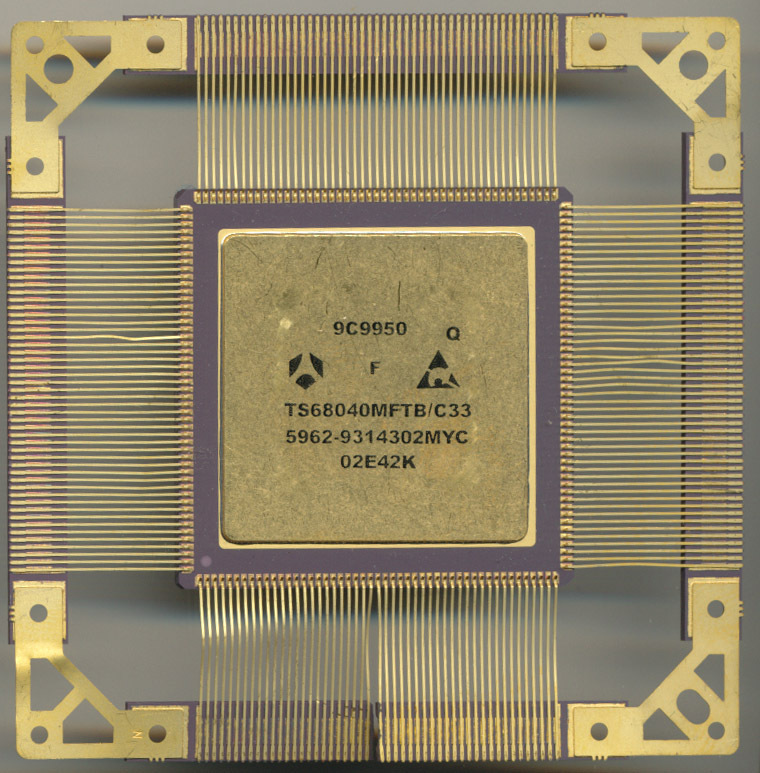 The bipolar process is used to make TTL, and ECL type products, and had been used in several previous processors, including the AMD 2901 and the SMS300 (Signetics 8X300). The B2120 was part of a complete floating point chip set that was released in 1987. the B2120 handled all the ALU functions, while the B2110 was the multiplier. It was designed by Bob Elkind who was one of the original employees of BIT and oversaw the development, layout, and packaging of most of their early products. The B2120 was a TTL compatible device while the B3120 and B3110 made using ECL 10KH instead. Both were made using Bipolar’s proprietary P111 1.2 micron process. The B2120A-30 had a typical cycle time of 30ns, giving it an effective clock rate of 33MHz. 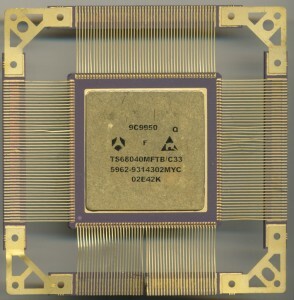 BIT would later make a SPARC chipset called the B5000 (which at 80MHz was the fastest processor of its time) and a follow on version called the B6000. Both were made using ECL. 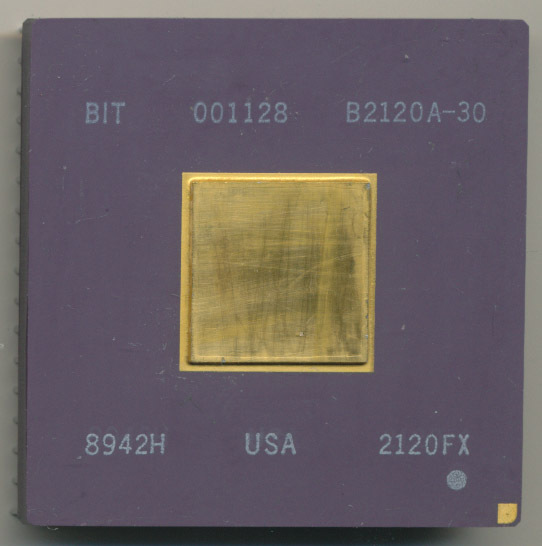 Reliability problems and the eventual catchin up of CMOS in speed led to their demise, and in 1996 BIT was purchased by PMC-Sierra (who ended up consolidating a lot of 80’s and 90’s companies). The Intel 4004 processor gets much attention for being the ‘first’ processor, however, there were others. The Rockwell PPS-4 was introduced in 1972, making it one of only 4 processors of the time (IMP-16 from National Semiconductor, Intel 8008 and Intel 4004 being the others. The original PPS-4 came in a 42 pin Quad Inline package, compared to the 4004s somewhat limiting 16 pins. A complete system could be built using 3 chips, a 10660 (later the 12660) PPS-4 processor, a ROM, and a clock generator (10706). The PPS-4 was manufactured on a metal gate process (vs the silicon gate process of the 4004). It required a single -17VDC power supply and ran at 256KHz. In 1975 Rockwell introduced the PPS-4/2 (aka the 11660). The ‘/2’ denoting the 2 chip version of the PPS-4. The clock generator was now moved onto the processor itself, and a memory/IO chip (part # A17xx) that provided 2048×8 bits of ROM 128×4 bits of RAM and 16 1 bit I/O ports. Clock speed was 200KHz, slightly less than that of the 3 chip PPS-4.